Bret Michaels' father Wally Sychak says he's spoken to his son, 47, who remains in critical condition after suffering a brain hemorrhage last week. "The fact that he was talking to me, and giving me information, I thought that was great," Sychak tells Extra. On the phone, Michaels "sounded a little slow, but fine," says Sychak. "He was talking, not as cheerful as he usually is. But I guess he is under sedation. But he understood what he was saying and knew me. Everything seemed good that way." Sychak says the former Poison front man also is starting to move his limbs again. "They say he's moving his arms and hands," he says. "The best as they could expect at this time." A rep for Michaels tells UsMagazine.com the rocker remains "under intense observation from doctors and staff. He's on a lot of medication, and going through all these tests ... they're still trying to figure out why this occurred. Doctors are seeing all the tests, hoping the worst is over." Meanwhile, the rocker's pals are praying for the best. What's happened to him is "just hideous," his Celebrity Apprentice costar Sharon Osbourne told Us Monday at the NBC Universal Summer Press Day in Pasadena, Calif. "It's devastating, and it makes you feel all these different feelings. Your heart goes out to his family, your heart goes out to him. He's the nicest guy in the world. And then you start thinking about your own mortality. You start thinking, Oh my God. It just makes you appreciate how lucky we all are." Hopefully this is a good sign in the direction of recovery! Test results indicate a setback in Bret Michaels condition a side effect from the brain hemorrhage called hyponatremia a lack of sodium in the body which leads to seizures. 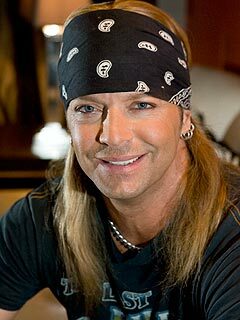 Bret Michaels was the topic of Larry King Live as Donald Trump, Jr. and other celebrities weigh in on Michaels condition. Due to the severity of his condition, Bret Michaels continues to remain hospitalized in an intensive care unit at an undisclosed hospital. He remains in critical but stable condition according to his doctors. Last night on Larry King Live Bret Michaels condition was the topic on the show as Donald Trump, Jr., Darryl Strawberry, Sanjay Gupta and Carlos Diaz discuss concerns, lasting affects as well Michaels as a person. Donald Trump, Jr. stated that "Bret is very likable guy, down to earth and a solid person." He stated "out of all the people from 'Celebrity Apprentice,' I may have had the best kind of off-camera relationship with him over the three years." Trump, Jr. also says he is a great father and rocker and concerned for the singers health. Strawberry who starred on Celebrity Apprentice with Michaels says he is a good friend on and off camera. He is a hard worker and is a creative force on the show. Without a doubt he lives a crazy lifestyle and he wishes him a speedy recovery. Carlos Diaz who is a Radio Host and Entertainment Correspondent says Michaels is "a star that transcends several generations." He has reinvented his career, both on "Rock of Love" and "Celebrity Apprentice" as well as his music. Dr. Sanjay Gupta is CNN's chief medical correspondent says a subarachnoid hemorrhage is an aneurysm in one of the blood vessels. He stated about 10 percent of people don't survive. He obviously survived that. About another quarter of people don't make it through the first couple of days in the hospital and 30 percent make a full recovery. Michaels' medical workup demonstrated findings of a subarachnoid hemorrhage, a type of stroke that causes bleeding in the fluid-filled spaces around the base of the brain. It presents itself suddenly as the sound of a loud gunshot or thunderclap at the back of the head causing severe cranial pain and muscle spasms. Many people are speculating Michaels head injury suffered from a prop striking the singer at the Tony awards last June is the cause. Additional studies are planned throughout the week to hopefully detect the exact cause of the rupture. Coupled with the fact that Michaels is a lifelong Type 1 diabetic and has recently undergone emergency appendectomy surgery while on tour in San Antonio, he will remain monitored closely by his medical team to make sure no complications occur from the diabetes. The most common cause of this condition is a spontaneous rupture of a cerebral aneurysm, however, 15 to 20 percent of spontaneous episodes of this hemorrhage are found to have no cause. Michaels has undergone a continuous series of tests while in the ICU including angiograms, CT scans, MRI’s and transcranial dopplers (TCD's). Doctors state Michaels is very lucky as his condition could have been fatal. With further testing and rehabilitation, they are hopeful that Bret will gradually improve as the blood surrounding the brain dissolves and is reabsorbed into his system, which can be a very painful recovery and take several weeks to months. Michaels remains under 24-hour observation in the ICU and is in positive spirits. He is responding well to tests and treatments. Even though today was a minor setback Doctors remain hopeful for a full recovery and plan to release more specific information next Monday. As Bret Michaels continues his recovery from a brain hemorrhage, the rocker has encountered a "setback" involving a side effect that leads to seizures, his rep confirms to the Daily News. The former Poison frontman, 47, who remains in the ICU under 24-hour observation, was found to have a side effect called hyponatremia, which is a lack of sodium in the body that leads to seizures. Though his rep didn't confirm whether he has suffered any seizures, Michaels is said to be in critical, but stable condition. Medical work revealed that the rocker suffered a type of stroke called a subarachnoid hemorrhage, which causes bleeding in the fluid-filled spaces around the base of the brain. This is said to suddenly present itself as the sound of a loud gunshot or thunderclap at the back of the head, causing severe cranial pain and muscle spasms. Michaels, a standout competitor on this season's edition of NBC's "Celebrity Apprentice," was rushed to the hospital Thursday night with an excruciating headache that turned out to be massive brain hemorrhage. Though additional tests are planned throughout the week to detect the exact cause of the rupture, Michaels' rep pointed out that "many people are speculating [his] head injury suffered from a prop striking the singer at the Tony awards last June is the cause." "Coupled with the fact that Michaels is a lifelong Type 1 diabetic and has recently undergone emergency appendectomy surgery while on tour in San Antonio, he will remain monitored closely by his medical team to make sure no complications occur from the diabetes," his rep continued. Michaels' father, Wally Sychak, told The News that his son "sounded very good" when they spoke on the phone Saturday night. "He was a little slow, but everything made sense and he knew who I was," Sychak said Tuesday. "I told him I wanted to go out there, and he said to wait until he gets home." He added that Michaels was able to move his arms and legs, a good sign in his recovery. Michaels is said to have since undergone a continuous series of tests while in the ICU, including angiograms, CT scans, MRI's and transcranial dopplers. He is considered lucky as his condition could have been fatal. "With further testing and rehabilitation, they are hopeful that Bret will gradually improve as the blood surrounding the brain dissolves and is reabsorbed into his system, which can be a very painful recovery and take several weeks to month," his rep added. "Even though today was a minor set back, doctors remain hopeful for a full recovery." Though it has not been revealed where the rocker is being treated, Sychak told The News that Michaels is under the care of neurosurgeons in Arizona. Rocker and reality TV star Bret Michaels is recovering from a brain hemorrhage he suffered last week and could resume his concert tour next month, according to a statement on his website. Michaels, 47, suffered a massive brain hemorrhage and was hospitalized last Friday. In a statement, his manager Janna Elias said, "Doctors remain hopeful for a full recovery and plan to release more specific information next Monday," CNN reported today on its website. The statement from Elias said that Michaels, who was the frontman for the rock band Poison, suffered a side effect from the brain hemorrhage called "hyponatremia" caused by a "lack of sodium in the body which leads to seizures." "He is responding well to tests and treatments," she added. Elias said Michaels' tour could resume as early as May 26 in Fort Smith, Ark., "provided there are no further complications or setbacks." The possibility Michaels could return to performing next month comes just six days after what has been described as a near-fatal attack. "Doctors state Michaels is very lucky as his condition could have been fatal," Elias said. His manager and publicist have been careful not to disclose the hospital or even the city where the singer is being treated. They have said the location has been kept secret for security reasons. While Michaels is starring in the current edition of NBC's "Celebrity Apprentice" -- which was taped last fall -- and he's also slated to appear on "Fantasy Camp," a new series premiering July 9 on VH1. Sounds like good news with him being able to recover from this but I really hope it isn't true about him going back to touring in a month. I hope he gets some much needed rest and let his body totally heal as to not exacerbate anything. yeah I thought the same thing. I mean the guy almost died from a brain hemorrhage and they are talking about him going back on the road in May??? Sounds a little nuts to me but I am glad he is on the road to recovery! CBS) A week after suffering a brain hemorrhage, rocker Bret Michaels remains hospitalized in Arizona, but he is making plans for the future. A post that has since been deleted from the 47-year-old Poison frontman's website said he was planning to resume his Roses and Thorns tour with a sold-out May 26 show in Fort Smith, Ark., that had been postponed from earlier this month when Michaels underwent an emergency appendectomy. been fatal," according to a statement posted Tuesday on his website, which was also provided by Michaels' New York-based publicist Joann Mignano. Michaels has developed a side effect that causes seizures, according to the Tuesday statement. The condition, called hyponatremia, stems from a lack of sodium. The statement did not indicate if Michaels had actually suffered any seizures. VH1 PLANS SPECIAL AIRING OF "BEHIND THE MUSIC: BRET MICHAELS" FEATURING FAN SENTIMENTS TONIGHT APRIL 29! In the five days since Bret Michaels was admitted to the hospital after suffering a massive brain hemorrhage, over 400 of you have left well-wishes for Bret in the comments section of our blog. As a way to show our collective support for Bret as he valiantly fights to recover, VH1 will be airing a selection of reader comments during our special re-airing of his Behind The Music this Thursday, April 29 at 11 p.m./10c. If you would like to share your sentiments about Bret with everyone who’ll be watching his Behind The Music episode, all you have to do is leave a comment below sometime before this special broadcast airs tonight. We’ll be combing through all of the comments and picking a selection of them to run during the episode. We thank you for your continued support and well wishes. Bret remains in critical condition in ICU under 24 hour supervision by doctors and medical staff. If a patient survives the initial rupture, the first 7 to 10 days after are the most critical as an additional rupture or other complications may arise. Doctors are also continuing to treat Bret for the hyponatremia and today he will be undergoing more testing as well as an additional MRA. There will be a press conference on Tuesday at which doctors who have been treating Bret will further explain his condition, treatment and prognosis. Location and time of the press conference will be released Friday. Bret was supposed to come to Indy on tour in June (I believe) & some friends & I had planned on going. I can't believe there's talk of him actually keeping those tour dates. I definitely think he needs to take some time off, poor guy! Barely two weeks after suffering a brain hemorrhage, Bret Michaels has been released from the hospital and is poised to make a complete recovery, his doctor said. "Mr. Michaels was indeed a lucky person, a very lucky person," Dr. Joseph Zabramski said at a news conference Tuesday at the Barrow Neurological Institute at St. Joseph's Hospital in Phoenix, where the rocker was treated. "He is making a good recovery. I really except that he will make a 100 percent recovery," Zabramski said. "He is one of those lucky people, the 20 percent who have a subarachnoid hemorrhage, who make a full and complete recovery." Zabramski did not disclose when the 47-year-old Poison frontman and Celebrity Apprentice contestant had been discharged. However, he said Michaels was walking on his own and that his level of consciousness has returned to what doctors call a normal state. Although Michaels did not need any surgery after he was admitted to the ICU on April 22, Zabramski said that the singer has been experiencing back pain and increased spasms, because his Type 1 diabetes has prevented him from taking certain medications. "He has had to continue to suffer with this pain and discomfort, but he is improving and he will continue to gradually improve," Zabramski said. He also said Michaels' medical team will continue to closely monitor his vital signs and neurological status over the next couple of weeks while Michaels receives physical therapy. Despite the side effects, Zabramski sounded optimistic about Michaels' long-term prognosis after testing done on April 28. " At this point we were feeling pretty confident that Mr. Michaels does not have an aneurysm or any other problem with his blood vessels that could result in a recurrent hemorrhage," Zabramski said. Late last week, Michaels' camp began rescheduling tour dates for as soon as May 26. However, it is unknown if Michaels will be able to return to the road that quickly, since he still has to undergo physical therapy. It is also unknown whether Michaels will be able to attend the live season finale of Celebrity Apprentice, which airs Sunday, May 23 at 9/8c on NBC. As of the latest episode, Michaels remained in the running to win the reality series. That is amazing! He must be one strong person!! I really hope he has a speedy recovery! 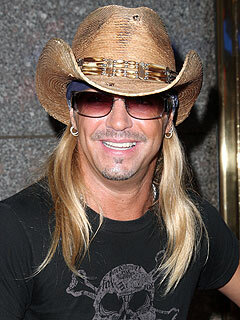 I like him on Celebrity Apprentice and I liked him on Rock of Love, I only saw the first season of that. I always thought Bret came off like a good guy but the women just made it way too trashy that I couldn't watch another season. I hadn't realized that BM was back in the hospital. He still plans on being at the finale on Sunday though. Hope he can be there! Bret Michaels suffered a serious setback in his recovery from a brain hemorrhage, experiencing a small "warning stroke" that sent him to the hospital, where tests then revealed he also has a hole in his heart. Both conditions are treatable and are not believed to be connected to his subarachnoid hemorrhage. But his doctor questioned whether Michaels can return as hoped to the May 23 finale of Celebrity Apprentice or to a concert on May 28. "Without a doubt he is very determined to get healthy and make a 100 percent recovery. Medically speaking it is a fantastic attitude both mentally and physically for him to have," neurosurgeon Dr. Joseph Zabramski says on Michaels's Web site. "However, Bret's brain and body are not quite 100 percent yet, especially with the hole found in his heart." Michaels's rep, Jann Elias, says the 47-year-old rocker is "in good spirits, great medical hands and is positive and hopeful that everything is going to be okay." As for his condition Elias says, "He is up, walking, talking, continuing his daily rehab and very happy to be alive but he has made it clear he is sick and tired of being in the hospital and is ready to rock again." According to his doctor, Michaels was readmitted to the hospital this week after experiencing numbness on the left side of his body, particularly to his face and hands. He was diagnosed with suffering a Transient Ischemic Attack, or TIA, described as a mini-stroke or warning stroke that causes stroke-like syptoms but doesn't cause lasting neurological damage. MRI and CT scans then discovered that Michaels had a hole in his heart. "There is no doubt that [this] is devastating news to Bret and his family," says Zabramski. "The good news is that it is operable and treatable and we think we may have diagnosed the problem that caused the Transient Ischemic Attack." Calling it "highly unlikely" these problems are linked to the brain hemorrhage, the doctor adds: "Once again it is great that he quickly reacted to the severe numbness and got to the hospital immediately." Bret Michaels is definitely a man with a mission: After suffering a small warning stroke, the rocker still has his sights set on showing up at the May 23 finale of NBC's The Celebrity Apprentice. "As far as I know, Bret will be there unless his doctors tell him otherwise," says his rep of Michaels, who would be facing off against Holly Robinson Peete in the final boardroom evaluation with Donald Trump. "We're cautiously optimistic that he will attend the finale," continues the rep. "But ultimately, it's up to his doctors." Earlier in the week, Michaels felt numbness in his arm, which he at first thought might be because of his rehabbing twice a day. But when it persisted, he returned to Barrow Neurological Institute, where tests then revealed that he had experienced a stroke and that Michaels also has a hole in his heart. Both conditions are treatable and are not believed to be connected to his subarachnoid hemorrhage. Dr. Keith A. Siller, Medical Director, NYU Comprehensive Stroke Care Center says that it could be safe for Michaels to fly to the Apprentice finale, because he is on blood thinners to prevent further clots. "Being on a blood thinner – which is one treatment that can be offered in the interim while they decide what to do [about the hole in his heart] – does give him some protection, so he probably could fly," says Dr. Siller, who has not treated the rocker. "As long as he’s on the blood thinners, that offers him significant protection against another stroke even with the hole not being closed." But whether Michaels should or not is another story. But Michaels does feel that he has survived his recent health crises for a reason. "I don't know what that purpose is exactly yet," he told PEOPLE earlier this month. "Whether it means winning a lot of money for diabetes or it means just being a good dad, I feel very blessed." Poor Brett. This guy needs a break. I read rumors that the Apprentice finale was put on hold but I haven't found any official notice of that yet. I heard he will still be at the finale which I guess is tomorrow night? He's gone through so much, he definitely needs to be cut a break. I hope he recovers from all this and lives a long healthy life, he's definitely a fighter! This is the best update ever for Bret! Nice job, he looked awesome! That certainly was a nice surprise to see Bret at the finale for Idol, I didn't expect that. It was the highlight of the finale for me and he sounded incredible! Bret Michaels fans were stunned when he performed the 80s Poison classic "Every Rose Has Its Thorn" on Wednesday's American Idol finale. "The doctors, I didn't tell them I was going to do this," he told UsMagazine.com. "I never told them I was coming here. They're going to find out in a few minutes!" As for his family, "I may not have told them, either," he added. The new Us Weekl reports that the 47-year-old rocker and father of two -- who nearly died after suffering a "warning stroke" and a brain hemorrhage in April –- has been worrying friends and family that he is putting his health at risk by refusing to put the breaks on his hectic schedule. "Just based on watching him, you could tell his body is not where his spirit is," his younger sister Michelle Sychak tells the new Us Weekly. At the Idol finale, Michaels told Us, "To be honest, there's still obviously a lot of pain I’m still experiencing ... [but] I feel great. "Here’s the thing," he added, "they have not said everything’s OK. I’m running about 75 percent realistically, physically, but in my soul and my heart, I feel great. "I needed to do this tonight, just to come here," said Michaels, who told Us that he was first approached to perform on the Idol finale months ago before he got sick. "It’s my first musical performance back and after this, I’m hoping to go out on the road, and I’m really looking forward to it." On Friday, he told Us he is going to attempt to do a show in Biloxi, Miss. "I’m going to see how that goes and just take it a few shows at a time," he told Us. He said he "was so excited" to return to the stage for Idol. "Later on, I may collapse, but right now, I feel great." While performing, "my heart was pumping," he told Us. "I got on stage, first of all, the fans and friends and family were all here. It was such an awesome feeling to see everyone screaming and cheering and singing along with the song. I was like, 'Hey, that’s three generations out there, that’s all I’ve wanted to do is have a great music career and to be able to do that, 20-some years later, that’s a great feeling. "I wanted to be here with y’all tonight," he added. "This was good for my soul. Idol runner-up Crystal Bowersox told Us she thought Michaels' performance was "inspiring." Said the singer, 24: "With his health issues and the things that he’s been through recently, it’s inspiring to me that he gets up and pushes through it." In case anyone missed this, Bret was on Leno the other night. I was lucky enough to catch it. Good interview with some good laughs. Yes I saw it, I just can't get enough of him and his recovery. It's short of amazing to see how well he's doing. Rather than Bret going back to doing those trashy Rock of Love shows I would like to see him do a reality show with his gf and kids and getting back into his work. I know everyone likes trash but I'm all about Bret just being Bret!